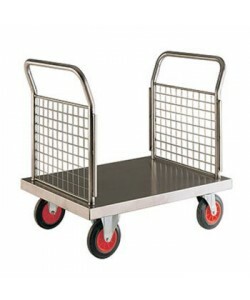 Platform trucks and trolleys are designed for handling bulkier items that are either too big or too heavy to be carried by hand or transported on a small footplate. 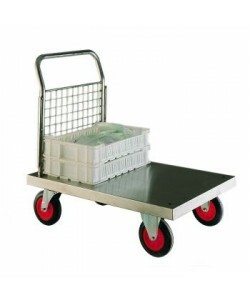 Stainless steel platform trolleys offer an impeccably hygienic and incredibly robust method of transporting and handling heavy goods or products within high care environments such as laboratories, food manufacturing sites, pharmaceutical plants and many more. Available in five different models, including the base only and versions with one, two, three or four sides, the stainless steel platform trucks are well suited for many applications. Perfect for the food and drink industry our stainless steel platform trucks are manufactured from 304 grade stainless steel. Rust and corrosion resistant, the platform trolleys are ideal for environments with strict hygienic requirements as the platform trucks can be easily and efficiently cleaned down. Equipped with four rubber tyred wheels, they are easily handled and help to keep noise levels down within busy food factories or manufacturing environments. Available with the base only or with one, two, three or four mesh sides, the platform trucks can be provided in several different formats to meet your requirements. The one sided stainless steel platform trucks, SP601M are supplied with a single end mesh panel and handle, for easy operating. 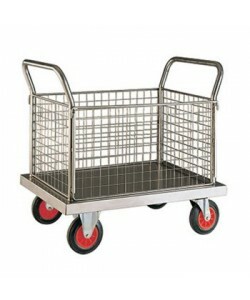 Two sided platform trolleys such as the SP602M have a mesh handled panel at each end of the truck. The SP603M is a three sided platform truck, with a removable third mesh panel helping to provide increased stability when transporting bulky items. The SP604M has four mesh sides, two of which are removable, allowing you to customise the platform truck to the intended application. Each of the different formats of stainless steel platform trucks are available in 3 different sizes, providing wider options for bigger and bulkier goods. 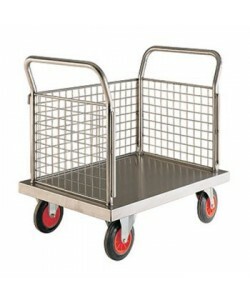 Easy to handle and extremely robust, the stainless steel platform trucks and trolleys are ideal for industrial environments.